Gorgeous canvas giclee from Star Wars: Episode VI - Return of the Jedi! A limited edition of 95 hand-numbered pieces. There's only one man good enough to rescue himself from imprisonment, and that man just so happens to be a Jedi. The Star Wars Luke to the Rescue Paper Giclee Print is quite aptly named, because that is exactly what is happening in this gorgeous paper giclee art print by James Silvani. 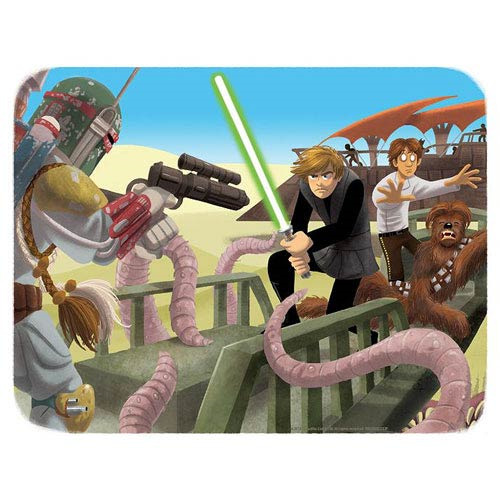 With the Sarlacc's tentacles grasping blindly at the Tattoine Cargo Skiff that Luke Skywalker stands on as he attempts to defend Chewbacca and the blinded Han Solo from the deadly Boba Fett, this detailed giclee captures the intense scene from Star Wars: Episode VI - Return of the Jedi and has been rendered in a style that is all Silvani's. Complete with Jabba's Sail Barge hovering in the background, this gorgeous piece of artwork has been printed on paper and is a limited edition of just 95 hand-numbered pieces. Complete with certificate of authenticity, the giclee measures 19-inches wide x 13-inches tall.